I was born on June 27, 1956, and have three older brothers as well as a younger brother and sister. Fortunately, out of the six of us, I am the only one with CF. After I was diagnosed, the doctors told my parents that I most likely would not live past the age of 16 – that they should keep me comfortable at home. Instead, my parents got me involved in sports with my brothers – playing football, baseball, and basketball before joining track and field and pole vault. Unknowingly, they helped me do the best thing to keep my lungs clear! In high school, I was a runner and pole vaulter and also had a number of jobs – including working with the handicapped and in a restaurant, along with print work and TV commercials for Burger King, Coca-Cola, Clearasil, and other catalogs. After graduating from high school, I attended UCONN, where I competed in pole vault – achieving a personal best of 16’3 at NYAC after school. Leaving home and living a normal life at college with roommates and being a part of a team was the best thing I had ever done. I never let CF get in my way, remained compliant, and learned how to be independent. Prior to volunteering at the Boomer Esiason Foundation, where I work on various educational and exercise programs to raise awareness and empower the CF community, I was a Vice President of Sales in the apparel industry. About 11 years ago as my CF progressed, I was forced to leave on disability. So today, I still volunteer at BEF and encourage CFers to LIVE, BREATHE, and SUCCEED. On April 18, 2012, I received a double lung transplant – and I have refused to let it slow me down. My motivation is reaching goals, meeting new people and learning from them, and passing on the things I have picked up over the years. 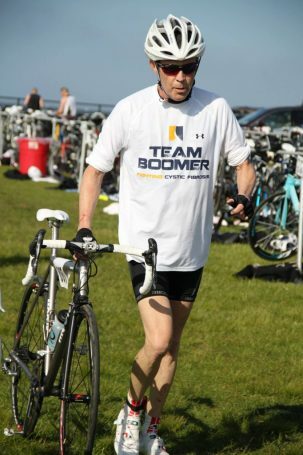 My favorite Team Boomer memory is a Half Ironman competition where I chose the biking portion, which was 56 miles. I thought it would be the easiest part – and boy was I ever wrong. It almost killed me! People passed me on mountain bikes while I was on a road bike that weighed 15 pounds. I guess people are right when they say it isn’t about the bike! Be RELENTLESS and anyone and everyone – then ask again. Most people can spare a few dollars. I exercise because it makes me stronger in mind, body, and spirit. It allowed me to postpone my transplant for as long as possible by keeping my lungs clear. And now, post transplant, exercise keeps my two gifts of life (my new lungs) healthy and allows me to pay tribute to my donor. What is your go-to song when you are working out? What is your plan for May – CF Awareness Month? I am going to continue to do what I do every day – raise awareness and try to inspire others with CF to get out and live every day to the fullest. BEF is promoting a bunch of great programs too, like: CF Podcasts, Ask Jerry on Facebook, Team Boomer SoulCycle, and You Cannot Fail programs.